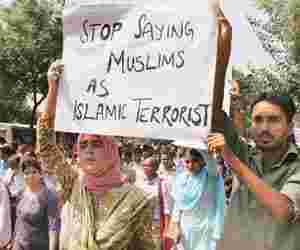 New Delhi: In just a fortnight, Jamia Nagar, best known as the host of the historic Jamia Millia Islamia, has become a world of fear. The realization hit A.K. Ramakrishnan, a professor at the university’s Centre for West Asian studies, after 19 September. That’s when bullets fired by the police at Batla House, one of the several closely nestled buildings in the area, killed one student, and also shattered a sense of security for others, creating shrouds of suspicion overall. Instantly, effortlessly, Jamia Nagar transformed into an alleged haven for terror merchants. A “laptop became a stronger weapon than an AK-47 and the terrorist emerged as the educated, Internet-savvy Muslim, and most possibly, a Jamia student", says Ramakrishnan. Now, a coalition of faculty, students and legal experts are fighting back, saying the scrutiny on the university is unconstitutional, and are offering legal aid to the detained. In the process, they contend with duelling definitions of Jamia Millia Islamia, better known as JMU, from its desire to be a minority institution while also remaining true to its secular founding. Already, several students living in rented accommodations in Jamia Nagar were asked to move out by their landlords, and two—Ziaur Rehman and Zeeshan Ahmad—were picked up by the police for interrogation. Even before the shootout, an Urdu scholar at the university was picked up by the police and later released. Countless others are moving to pre-empt such moves. One Muslim student at the university from Araria, Bihar, met Ramakrishnan with profound doubts. “My parents called me up and asked me to return home. They even went to the extent of asking me to deregister myself from the university. I don’t know when or whether I would be coming back," he said, speaking on condition of anonymity. Lecturer Manisha Sethi, like Ramakrishnan, was also flooded by an anxious stream of students, mostly Muslims, all waiting to return home. “They were all scared by the brazen witch-hunting by the police. That was time for us to act. We keep hearing of blasts in Ahmedabad and Mumbai, but this was too close for comfort. This was right at our doorsteps and we couldn’t just ignore it," says Sethi, lecturer at the varsity’s centre for comparative religions and civilization since December 2005, who visited the area several times after the encounter. She and 40 other colleagues, mostly non-Muslims, then did what is often unheard of in university circles. They moved quickly to form Jamia Teachers’ Solidarity Group, a counter-response to the “ugly stereotypes of Muslim students and the university at large", hoping to allay fears of their students and also bridge the quickly widening gap between the neighbourhood and the university. This was in addition to the unprecedented offer of legal aid tendered by the university administration to the detained students. Over the last 15 days, the group’s members have made frantic visits to the neighbourhood where about 200 students from the university stay, and demanded that the detained students be considered innocent until proven guilty. The university administration has even announced construction of new hostels to house more students. Currently, the hostels at Jamia accommodates 1,000 students. To all the initiatives, they say, the idea of the neighbourhood is central. “This is because this is where a large number of our students and teachers come from. We can’t abandon them and if they feel alienated, this does no good to anyone," Sethi says. But beneath the immediate and aggressively articulated response to the turn of events is a deeper concern. The overwhelming and perhaps unwarranted attention for the 88-year-old university—founded in response to Mahatma Gandhi’s call in the 1920s to boycott all educational institutions supported or run by the colonial regime—endangers its secular spirit, insists Tabrej Alam, secretary of the Jamia Teachers’ Association that unanimously supported vice-chancellor Mushirul Hasan’s controversial decision to provide legal aid to detained students, rattling off names of monuments on its campus and historic events that shaped the university. “Secularists like Dr Zakir Husain was our vice-chancellor from 1926 to 1948, and the President of the nation. We are disturbed and distressed by the misperceptions about our institution. Surely, this is not what we deserve considering our liberal and progressive record," Alam points out. For the most part, the university does live up to Alam’s feverish secular pitch. From the Bagh-i-Nanak, named after Sikh religious leader Guru Nanak to the majestic Dabistan-i-Gandhi, one of the academic complexes named after Mahatma Gandhi, buildings on the Jamia campus reflect its Weltanschauung, robust reminders of its tryst with the freedom struggle and secular thought. While the past is cherished, Anuradha Ghosh, professor at the university’s English department, also lists the successes of the present and argues that it does “embody the idea of India". “Jamia as a university has expanded like never before. With the expansion, we have various new centres and courses on a variety of subjects. We are no more an introvert university. We are asking questions and debating issues," she explains. Ghosh’s enthusiasm is palpable. From modern architecture on the campus to newly opened centres, the university wears an open look. More than 20 centres that have opened at the university in the last four years offer courses in subjects such as Gandhian studies, culture, media and governance, comparative religion and civilization, theoretical physics, interdisciplinary research in basic sciences, physiotherapy and rehabilitation sciences and West Asian studies. To most academic discourses, the theme of partition has become central, and not an untouchable topic. “Jamia as a university opposed the pernicious two-nation theory and has not wavered from the principles of pluralism and secularism. The expansion has attracted more students from various parts of the country and made it more secular and inclusive," Alam says. And, while Jamia’s tryst with terror may be new, the past few years did bring the reputation of violence to the university with administration sparring with the student union over admissions and fee hikes, and its teachers’ union demanding a “minority status" for the university. While the Jamia students’ union was later dissolved, a petition on the status is still pending before the National Commission for Minority Educational Institutions, seeking to reserve half the seats for Muslim students. Currently, the university has no religion-based reservations, though it does reserve 25% of its seats for students of Jamia wishing to continue further studies. Ramakrishnan says the petition is more relevant now than ever before. “With the stereotypes being propagated about the Muslims, it’s even more important to make space for them in institutions of higher learning. If you don’t allow them to move up the social ladder and have a future, what option do they have?" Alam, who is also general secretary of the Federation of Central Universities Teachers’ Association, cites the example of the Aligarh Muslim University (AMU), which has often been in the news for unrest on campus. “If universities like AMU and ours do not welcome students from the minority community, where will they go? It’s important more than ever that we protect our nationalist legacy while bringing Muslims into mainstream education." AMU teachers’ association notably extended support to Jamia in offering help to its students. But amid the earnestness of dispelling the stereotypes, questions about the implications of the university’s move to provide legal aid to the accused students once the investigations prove them guilty have become a forbidden territory. “We are just giving them a fair chance to present their case. This is just to instill confidence in our student community that their alma mater hasn’t abandoned them," Alam says. The 12,000-strong student community at Jamia would perhaps agree. But for Jamia’s many-coloured histories—with Gandhi’s begging bowl for its stumbling finances and Tagore’s welcome for its progressive school of thought— the present is an uneasy liability: an ironic picture of violence tugging at the heart of its secularism.